OLED technology enables thin, efficient and bright displays and lighting panels. OLEDs are currently used in many mobile devices, some TVs and lighting fixtures. OLED displays offer a better image quality compared to LCD or Plasma displays - and can also be made flexible and transparent. The actual OLED materials are transparent, and indeed it's possible to fabricate transparent OLEDs (sometimes refereed to as T-OLEDs). Many OLED makers are developing transparent OLEDs, and we have seen prototypes up to 55" in size (the largest and most advanced transparent OLED prototypes have been demonstrated by Samsung and LG). Samsung did intend to start producing 55" transparent OLEDs in 2016, but later decided to stop that program. Small (up to 2.4" in size) transparent OLED displays have been in the market for several years - but applications have been few and far between. Both Neoview Kolon and Futaba used to produce such displays (in April 2013 we posted a review of Futaba's 2" 160x128 transparent PMOLED panel - but both companies stopped producing these OLEDs and currently it is difficult to acquire non-custom transparent OLEDs. OLED technology can be used to make lighting panels - these are thin, area-lit and efficient lighting panels, that can be made transparent. Unlike displays, transparent OLED lighting panels have more immediate applications (embedded in windows, for example). 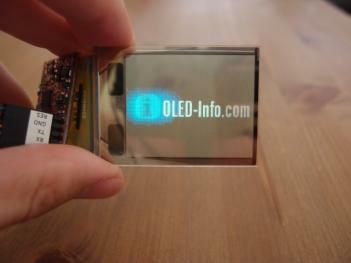 In April 2012 we posted our hands-on review with a transparent Tabola OLED lighting panel sample. 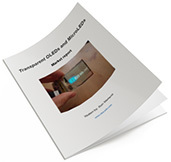 The report package also provides a complete list of transparent OLED developers and makers and their current (and future) products, and a lot more. Read more here! Panasonic has been showing transparent OLED display prototypes and concepts since 2016 (with the latest one shown last year in Shanghai) and today the Japanese TV maker has demonstrated a new transparent concept OLED display. 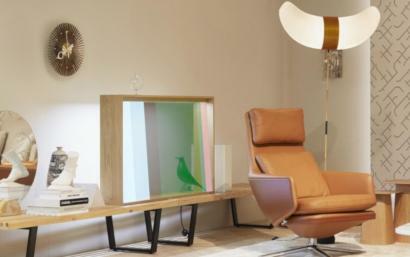 The new display, designed by Scandinavian based designer Daniel Rybakken in collaboration with Panasonic Design Kyoto uses a transparent OLED panel housed in a wooden cabinet that looks like a regular glass cabinet. Tianma demonstrated new display technologies at Embedded World in Germany, including two new OLED prototypes. First up is a 10.3" 91 PPI transparent AMOLED panel that features a transparency of up to 50% and high brightness (not disclosed). The second display is a 4.92" 403 PPI AMOLED that was produced using an ink-jet printing process. Tianma's technology was jointly developed with Guangdong Juhua Printing and Display Technology (which was established in 2016 by CSoT and TianMa). LG has been demonstrating 55" transparent OLED displays for many years, and the latest prototype shown at CES 2019 featured a transparency of 40%. The video shows LG's flower OLED installation made up from four curved 65" OLED TV panels, the 88" Crystal-Sound-OLED (CSO) panel with the built-in speaker, LG's new 65" Crystal-Motion OLED (which features an MPTR of 3.5 ms - the world's fastest according to LGD) and finally LG's latest 55" transparent OLED panels. LGD says that its 55" OLEDs feature a transparency of 40%. The company has been showing its large-area transparent OLEDs for many years, but we're still waiting for this technology to be commercialized. 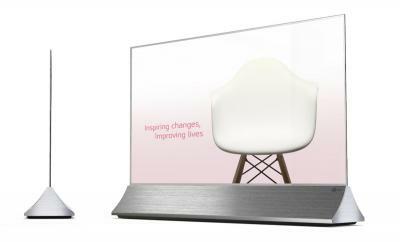 LG Display announced the OLED displays it will demonstrate at CES 2019, starting on Tuesday January 8th. We already know that LG Electronics will launch a 88" 8K OLED TV (the OLED Z9) but now LGD says it will demonstrate a 88" Crystal Sound OLED (CSO) panel - which has a sound system built into the panel (which acts as the membrane). LGD will also unveil a 65" 8K OLED - which you can see in the image above. Yeolight Technology (which was spun-off Visionox in May 2015) developed candle-shaped transparent OLED lighting panels. The segmented panels have five different lighting panels each with its own brightness. The total size is 11.26 x 26.26 mm (with a thickness of 1.05 mm). Yeolight tells us that these new OLED candles has been developed for a customer that will soon ship its final product to the market. The panels are now in production. Panasonic is demonstrating a new transparent OLED TV "Smart Glass" prototype at the China International Import Expo tradeshow in Shanghai. We do not have any specification of this panel. In September 2017 Panasonic demonstrated a 55" 4K transparent OLED, this could be the same display but we are not sure. We do not know who's the producer of the panel itself, but it is likely to be LG Display.